Let’s Turn White River Place Purple!! 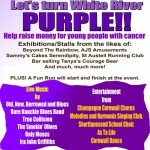 To help raise awareness and much needed funds for The Tanya’s Courage Trust, we are aiming to Turn Cornwall Purple! !